A church gymnasium in Mesa was the space where more than 100 asylum-seeking men, women and children from Guatemala and Honduras arrived Wednesday evening after spending several days in federal custody. They came in two white buses. In the parking lot area, a group of children zipped past the buses in scooters with the sun setting behind them, while volunteers with Central Christian Church unloaded backpacks and large plastic bags – the migrants’ belongings. Then, mothers and fathers and children – some being held, others walking while holding a parent’s hand – stepped off the bus to a walkway crowded on both sides with dozens of clapping and smiling locals. “Hola, bienvenidos,” said the voice of a welcoming woman. The arriving families waved back and returned the smiles as they walked toward the building where a bowl of warm chicken soup and a plate of yellow rice, refried beans and tortillas awaited them. It’s a familiar drill for Leisa McDonald, associate director of global outreach for Central Christian Church, a megachurch with five campuses in the Valley. This was the fifth time since October the Mesa campus has opened the doors of its large New Life Worship Center to sit, feed, clothe and connect the asylum-seekers with local families who would host them for a few nights. Within days, the Central American families will be on their way to different corners of the country, from California to Kansas, Texas or Washington to reunite with a relative and begin a formal, and likely lengthy, asylum process. 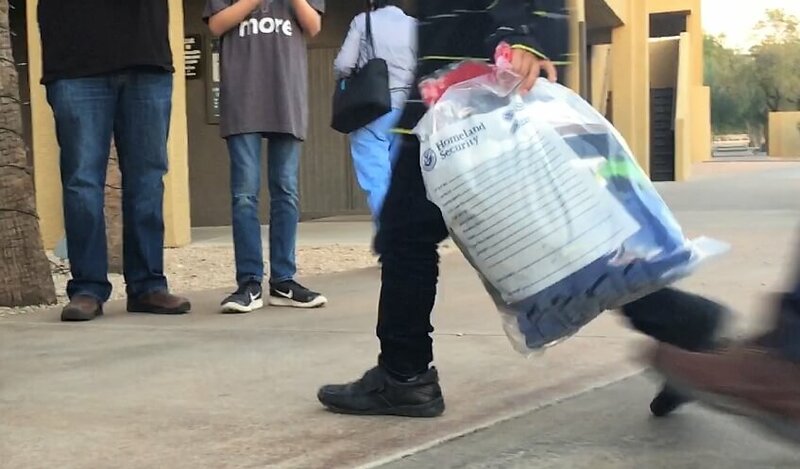 For almost two months, U.S. Immigration and Customs Enforcement has been releasing large groups of migrant families to churches and non-profit groups in Arizona. Pastor Magdalena Schwartz of Mesa is among the community leaders ICE has been working with to coordinate the releases. By her count, there’s been close to 5,000 people her group has received since Oct. 6. About a dozen churches in Phoenix, Mesa, Chandler and Gilbert have stepped up to host the release of families and volunteer people and resources to welcome and accommodate them, Schwartz said. “This is a humanitarian crisis and we are simply responding,” she said. Wednesday night, about 130 people, among them children and teens, turned out to help. By the end of the night, 47 local families would give an extra bed, futon, couch space or air mattress in their home to offer a warm and comfortable place for the Central American families to sleep. More migrant families are showing up on the border, especially the Yuma area. Many come to the U.S. fleeing violence, poverty, and government corruption in Central America. A 23-year-old mother of two, who requested not to be identified because she feared for her and her family’s safety, said Wednesday night she was fleeing death threats by members of gang in Honduras. She journeyed north with her cousin, who also had a child, and her brother, she said. As she spoke, her two-year-old boy ran next to her, stomping his new, little sneakers on the shiny wooden floor, while her seven-year-old girl looked through a coloring book of Disney princesses. The mother left her hometown, a port city in Honduras, 22 days ago, she said. With strands of curls framing her face, the mother said she lived in an abandoned building and sometimes, to get by, would sell roasted corn on the beach. Her mother used to own a food stand, but fled the country two years ago because of threats by gang members. She now lives in Texas. “When they found out I was her daughter and my children her grandkids, they asked me for money,” she said. A gang member recently confronted her. He pushed her, and threatened to kill her kids if she didn’t give them money. “My children were in danger,” she said. She described crossing a muddy river on the U.S.-Mexico border alone with her two kids. They all had scrapes from sticks and wire, she said. After crossing the river, she turned herself in to Border Patrol. She spent three days in federal custody, but her kids rarely ate the food provided. She was also detained, and then released, together with her cousin and her child Wednesday in Mesa. But she doesn’t know what happened to her brother. When asked how she felt, her full lips formed a half smile. For five hours, the church building in Mesa bustled with people and activity. Children ran around chasing each other, a group of girls colored animals with crayons and markers. A woman wore a long gray sweater with the words, “Raise Kind Humans.” Indigenous languages could be heard throughout. Volunteers helped young children pick a pair of shoes, while mothers and fathers sifted through donated clothes. In the opposite corner of the gym, a group of medics examined kids with fevers, coughs and dehydration. Sharon Martin, a nurse at Banner MD Anderson in Gilbert, was among them. She’s not a parishioner of Central Christian Church, but heard about the work of receiving asylum-seeking families that night from a colleague. Martin has been following the news about the migrant caravan camp in Tijuana. She said it’s important for her to show the Central American asylum-seekers they’re welcomed by people in this country. Her husband, Chad, and her two children, Swayer, 11, and Stella, 9, came to volunteer with her. They didn’t plan for it, but as the night passed, they decided to also share their home and host several migrants. The Martins don’t speak Spanish, but plan to get by with the Google Translate app. But there’s a “language of love,” they said. At the end of the night, the Martins made the drive back to their Phoenix home with three migrant mothers and their three children. “It’s the least we can do,” Chad said. Gilbert resident Laura Moffitt has helped receiving migrant families at the church on two other nights. For her, it’s about making sure the migrant families are a little bit better off than when they came. “They can let go of the worry for one night,” Moffitt said. This work has brought closer different communities of faith – Catholics, Christian congregations and the Church of Latter Day Saints among them – to practice what they preach, several volunteers and church leaders said Wednesday. “This has brought unity between communities that never thought could work together,” Schwartz said. I wish there was more about how the public could help. I can’t take anyone in but I could volunteer, donate food or clothing.